A famous scene from the opera Madame White Snake. The story was set at the West Lake in Sung dynasty, one day in the rain the young gentleman Xu Xian (left figure) saw two pretty girl at the pier and offered the umbrella to them leading to the romance of the story. Earlier on, Xu Xian rescued a white snake, it was moved and fell in love with Xu. The white snake transformed herself into Bai (white – right figure) Su Zhen and together with her friend Qing Qing (green – middle figure) appeared at the pier. Under her magical spell, Xu fell in love with Bai. As time goes by, many strange incident happened because of Bai and Qing. Xu Xian was approached by monk Fa Hai who told him the truth about his wife being a serpent spirit and gave him a monk’s bowl. As Xu Xian place the bowl over his wife’s head, Bai and Qing returned to their original selves. Monk Fa Hai took the bowl with the two spirits and build a Lei Feng pagoda on top of them. Click here to see other craft items featuring decoration on the story of Madame White Snake. 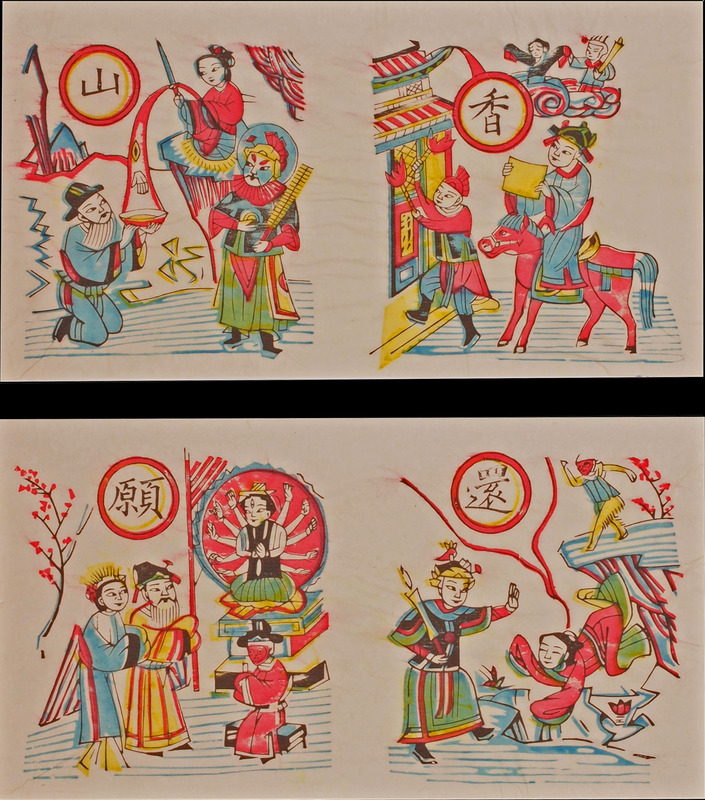 A opera theme wood block print – Votive Offering in Xianshang. 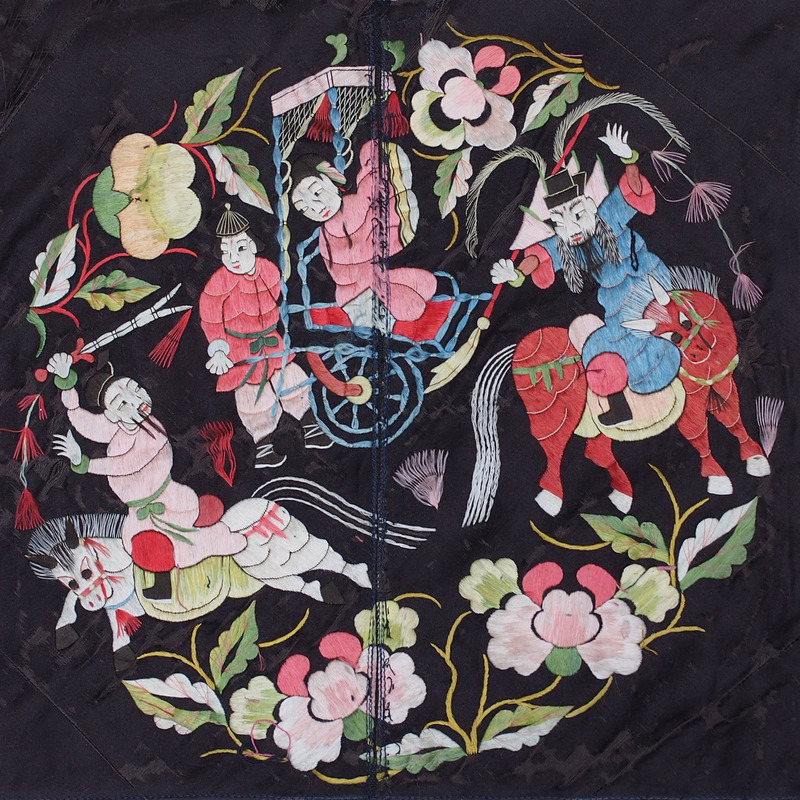 The story is about princess Miao Shang, the youngest daughter of ruler of the Miao kingdom. Miao Shang had an unhappy marriage and decided to become a nun. The ruler hated this idea of his own daughter, the royal princess, becoming a nun. He struck a deal with her, if the flowers she planted on a rocky cliff in chilly October could blossom she would be allowed to start her training. Miraculously the cliff was blooming with flowers that October, Miao Shang departed for her journey of Buddhism. The ruler was not at all happy and summoned for her returned, she ignored all his requests. Years later, the ruler got very sick, the doctors prescribed a odd dose of medicine which required a close relative’s eye and hand to be added the mixture. The two elder sisters refused, when Miao Shang heard about the news she rushed back and sacrificed an eye and a hand for her father. Soon after the ruler recovered she left for her training again. Unable to see his beloved daughter, the ruler ordered for the monastery to be burnt. On her escape, Miao Shang’s route was blocked by a tiger while the army was just behind her, unwilling to abandon her training she gave herself up to the tiger which swallowed her in one gulp. Miao Shang woke up inside a cave in Xianshang, there she started meditating. When the ruler finally found her in the cave she has already turned into the Avalokitsevara (the bodhisattva with a thousand hands and a thousand eye). Since then, the ruler would bring votive offering to Xianshang every year. 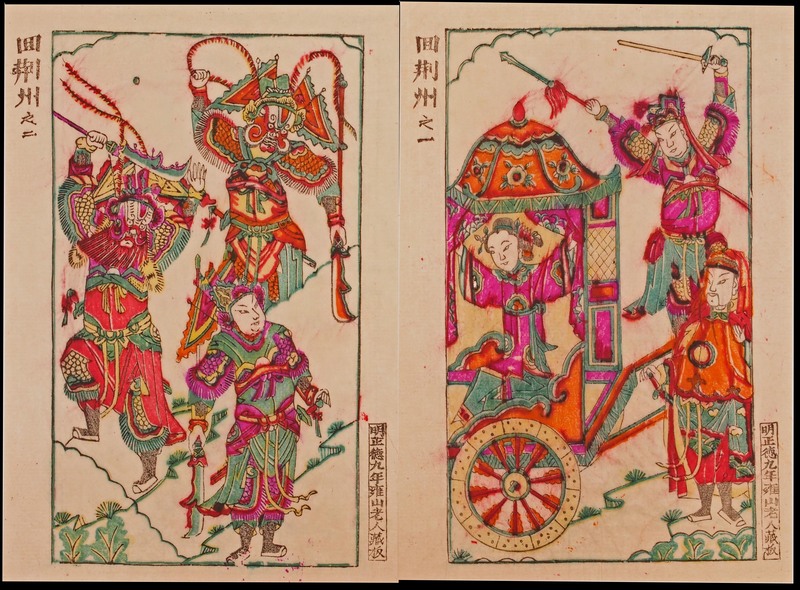 This pair of wood block print is not about blessings but scene from a opera story “Return to Jing Zhou”, set in the 3 Kingdom Period. Click here for the full story about Return to Jing Zhou and a print from the Yangliuqing school of the same theme. What is interesting about this print is the carving, 明正德九年雍山老人藏板 (stamp collected by old man of Yongshan in the year 1515 of the Ming dynasty) on the stamp. 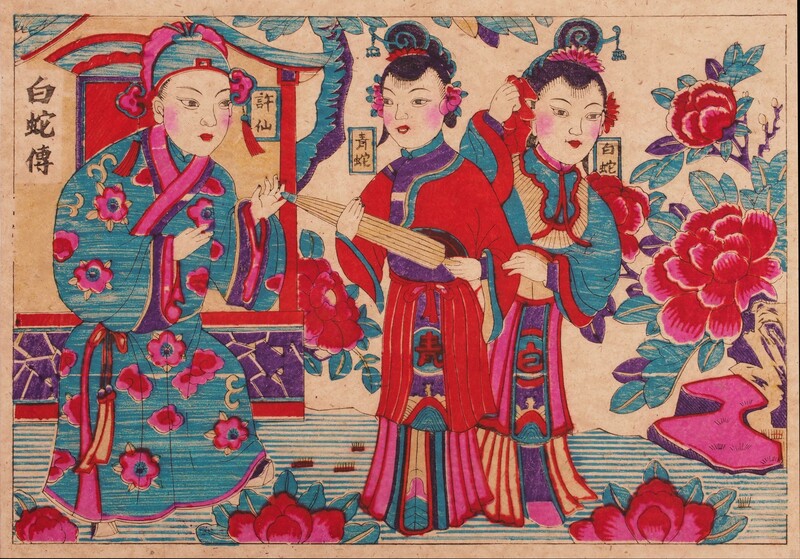 It is unlikely that the prints were made by the stamp collected in Ming dynasty but from a duplication of it. 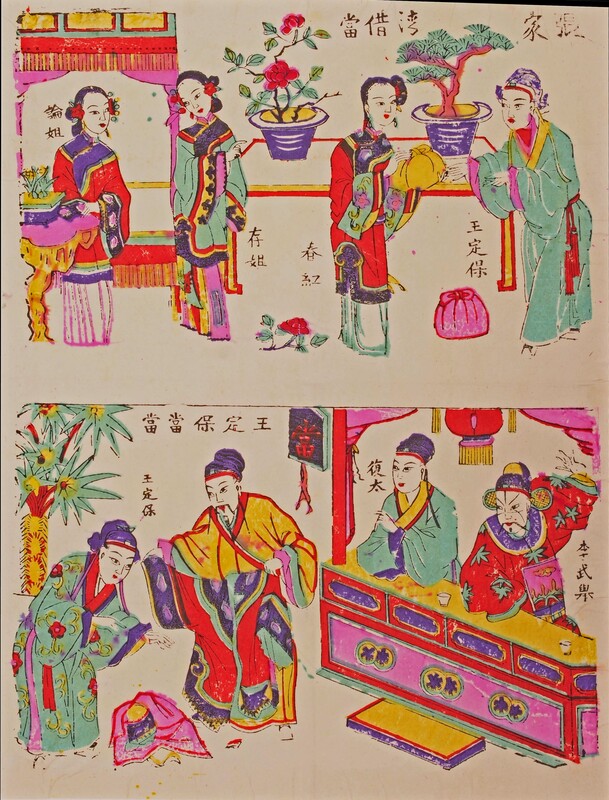 What these prints offer is a glimpse of the opera in the Ming dynasty and are often refer to in the historical theater research. Due to the age of this piece, some of its tassels and a few of the pompons have gone missing. 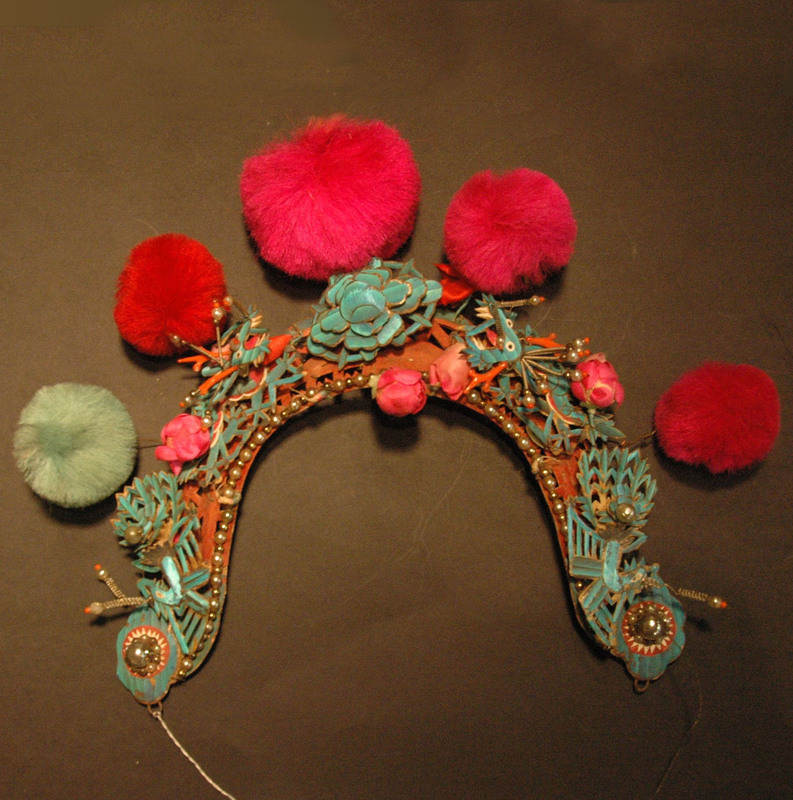 The blue ornaments on the head piece are made from kingfisher feathers, tian tsui, a precious material. The kingfisher bird has an amazing blue colour, however the intense colour is not from the pigment of the feather but from the reflection of the light. Each piece of feather is painstakingly cut and inlay onto a metal gilt. A relatively thin sheet of precious metal (gold or silver) is formed, gold or silver wires are bent according to the design and placed on the edge of this area, then small pieces of the feather is glued into the recess area. Apology for not blogging for the last few days. The blog is back on again! Knife-Horse-Man is the name for artifice whose subject is based on war based stories or opera. 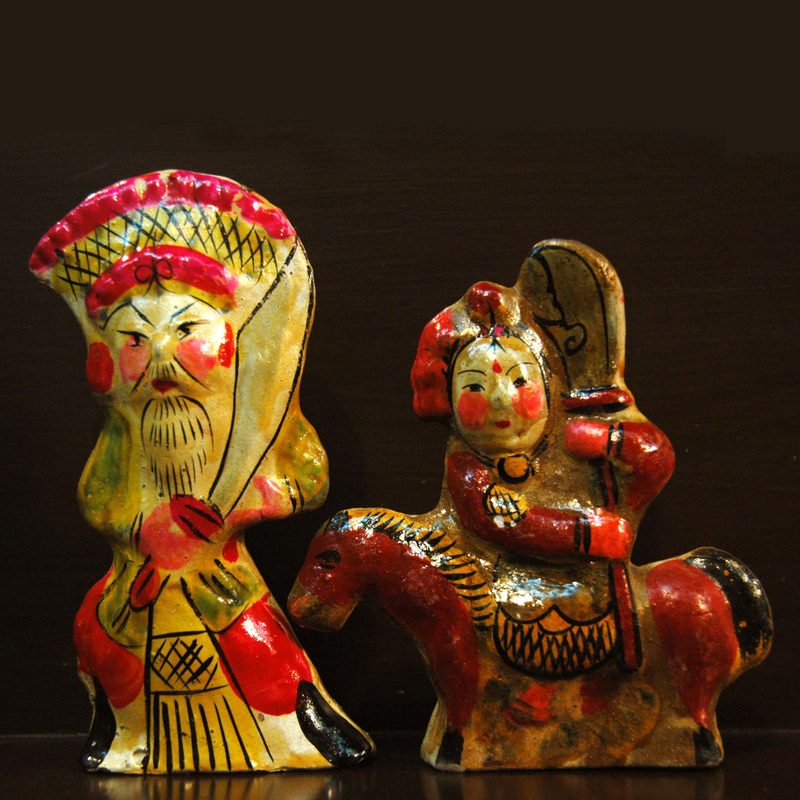 K-H-M can be found in paintings, illustration of ceramics down to folk toys like these. Some of the clay K-H-M figures can be as tall as 600mm, it is believed that they are able to protect the household.